It is clear that Elgin, Illinois needs to do some serious work on its PR department. Sue Olafson is OK when it comes to press releases about a new water tower or winning a federal grant. And she does a fine job making the mayor look good when he does a listening tour or wants to form a citizens’ strategic planning committee. But she is clueless when it comes to keeping the media informed about a killing that happened on the Fourth of July. Reporters were kept in the dark for 36 hours, then given wrong information. And no cops were available to talk about it. I’m not suggesting that a town of 100,000 needs a police public affairs officer. I’m saying that when we pay several police department employees $100K+ a year, they’d better be able to step up to a microphone and talk intelligently about a crime. They couldn’t do worse than Olafson. The liberal media had trouble with this story from the beginning. It just didn’t fit the narrative. The shooter was a 57-year-old Laotian man. The victim was an 18-year-old Hispanic. What can you do with that combo? They could handle a redneck teabagger with an itchy trigger finger. But a Laotian refugee? And if the vic were a white kids strung out on drugs, that would be a story. So, here’s what we came up with. The Daily Herald reporter was Tara Garcia Mathewson. She’s new; fresh out of journalism school. And she’s got a history of social justice reporting. She’s covered the use of tasers in prisons and the plight of the illegal alien. Her coverage was misleading from the beginning. She first said the kids were burglarizing the shooter’s car and he came upon them with a pistol. And she lacked information about the FOID card (he didn’t have one). Chalk it up to Olafson I suppose, but the Chicago Tribune had it right. Dave Gathman covered the story for The Courier News, a Sun-Times publication. Gathman has been working in Elgin for at least a decade. His story was rich in diversity, sort of a mix between apple pie, tacos, gyros and pot stickers. Gathman weaved a heart-rending tale that didn’t much sound like solid news. But that seems rather typical of the Courier these days. Jeff Ward and Mike Danahey are known to write in tabloid style on a regular basis. Very postmodern but lacking in hard facts. Tell the readers what you are feeling, Mr. Reporter. We really want to know. NOT! The Chicago Tribune, with reporter Melissa Jenco and freelancer George Houde (a former Elgin journalist with decades of experience) gives us the most humorous report of the weaponry. They wrote, “Police allegedly found the 25 mm pistol in the house, as well as a 357 mm revolver.” Who knew they made a revolver that took 14” diameter shells? Even a 25mm would give you a 1" shell. Yikes! Like I say, the press struggles with the narrative and the city struggles with the facts. FYI, Elgin subscribes to the CrimeReports.com program, giving us automatic access to crime data in the area. 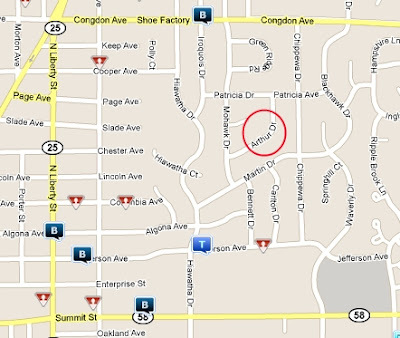 Two days after the shooting there is no mention of the crime on the CrimeReports map. So much for transparency on crime.